Finally, Free People comes to Miami! 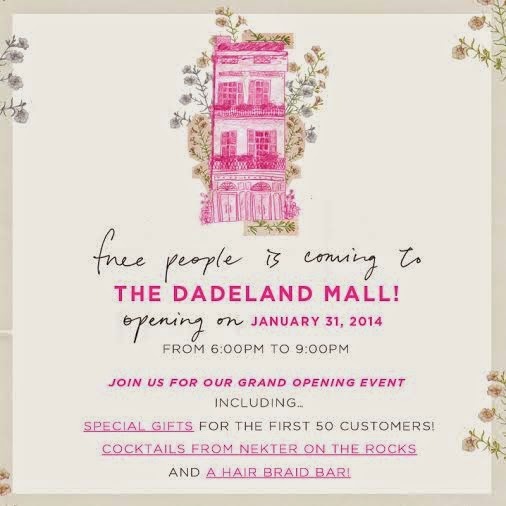 Is anyone else excited that Free People is opening up a store this month at Dadeland Mall! I'm so psyched to shop and have all those lovely eclectic prints and patterned clothes surround me. And of course they're throwing a fun party to get us even more excited! I hope to see you guys there on Friday, January 31st from 6-9 pm! There's gonna be drinks, yummy treats, goodie bags with gift cards up to $100 and even a hair bar. It's gonna be such a fun time! RSVP here.